SolidWorks empowers users to move seamlessly onto 3D CAD while providing the choice of retaining legacy 2D CAD data in native form, thereby saving time, eliminating conversion effort and reducing cost of ownership. 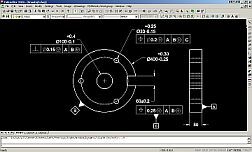 SolidWorks 2D Editor (formerly DWGeditor) is a 2D DWG Drawing Editor that is provided FREE to SolidWorks Users for protecting their existing AutoCAD DWG drawings without the necessity to Upgrade AutoCAD once SolidWorks investment is made. This saves money on costly 2D CAD upgrades. For SolidWorks Subscription customers SolidWorks 2D Editor (formerly DWGEditor) is Upgraded FREE of Cost along with every Upgrade of SolidWorks ! Why move to 3D Now? Elimination of Re-work (off-site as well as on-site) due to Interference, design changes while providing accurate Bill-of-Materials ( BOM ) at the RFQ Stage ! Simply Stated - To Design Better Products that Customers Deserve ! Leverage on Next Generation Technology ! Truly Pleasant Design Engineering Experience ! Ready to Migrate from 2D CAD to 3D SolidWorks? Path to 3D: 10 Successful Strategies Every Design Leader show know !